Aerial View - Villa Madeira facing the Gulf of Mexico with beach side pool. 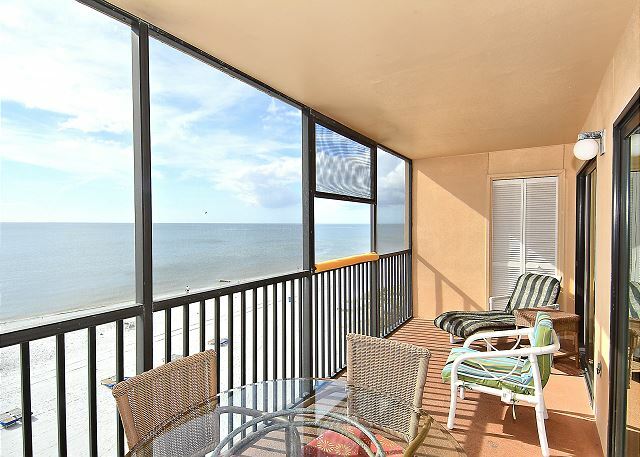 Many updates have been made in this Gulf front condo. 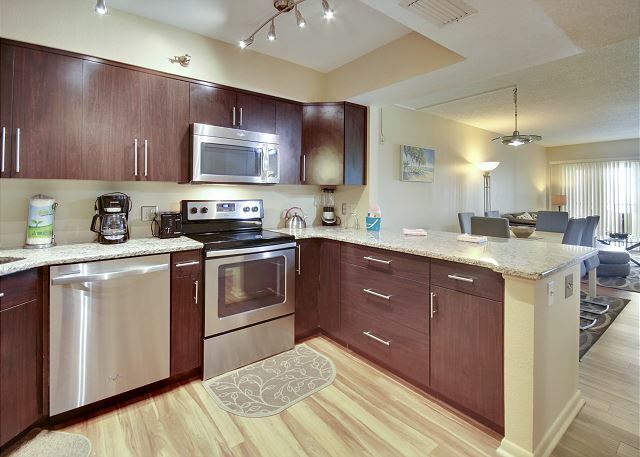 The renovated kitchen is beautiful and fully equipped. Sparkling tile on the floors, modern furniture, a king bed, queen bed and twin beds in the den are just a few of the pluses. The big screened-in balcony is the perfect spot for watching the glorious Florida sunset. 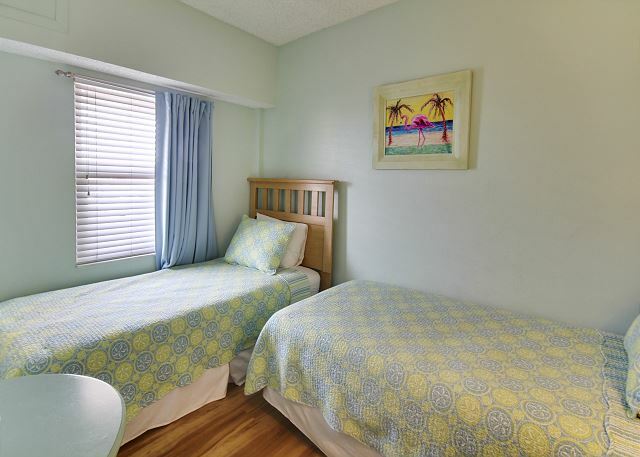 You are within walking distance to restaurants, shops and other beach activities. Free DSL wireless internet service is available. Location was amazing being right on the beach. 3 bedroom condo with 2 baths was perfect for 4 adults. Easy rental process and extremely pleasant staff. Had a rental car, but did not need it expect to grocery shop. We walked to all the restaurants and shops. We are SO happy we could help with your vacation and that you reached out to us! 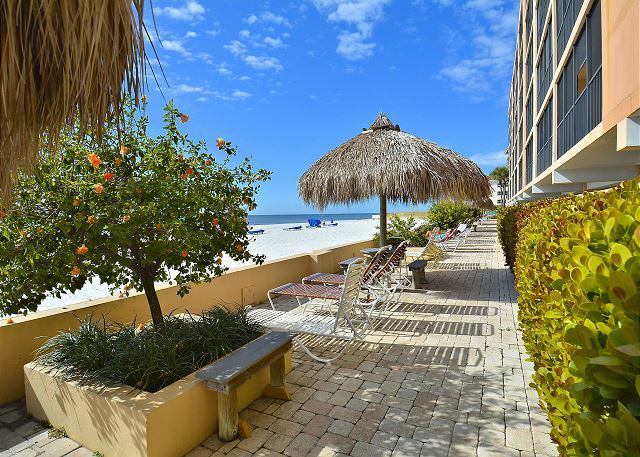 Glad to hear this updated, beachfront condo on Madeira Beach was a good fit for you all and we hope to see you back for another visit with us. This was our third stay at Villa Madeira. This time in #505 and we really enjoyed our stay again. It's simply the perfect beach getaway! We loved to have breakfast and sometimes dinner on the balcony. The closet was full of water floats, toys, and beach chairs - our two boys were delighted! Some comments: Both TVs are outdated and should be replaced. Also, it would be nice if there were more possibilities to hang stuff - e.g. a key rack in the hallway and a towel rack on the balcony etc. The noise from the condo above is quite annoying. You hear every step and it often sounds like they are moving furniture around. Earplugs were helpful getting to sleep on some occasions. 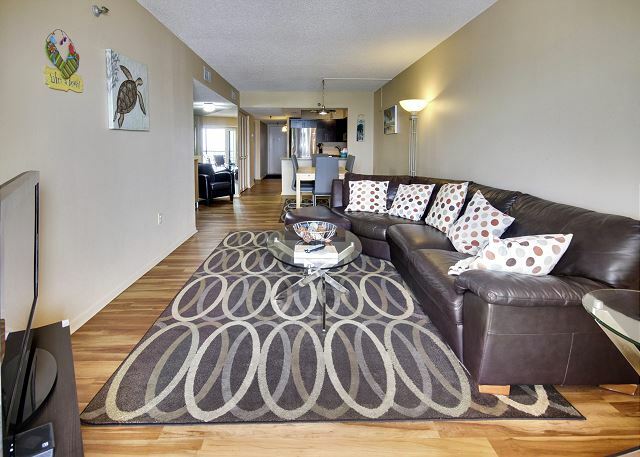 We believe that the condo above has tile flooring without sound insulation - maybe more rugs would help! This was the best Florida vacation experience we have ever had. Perfectly serene view. Super comfortable space. Kitchen was fully stocked for cooking. Porch closet was full of water floats, toys, and beach chairs. Master shower is AMAZING. Pool and beach right downstairs and very accessible. Temperature of the water was excellent, could walk right in. Never had to wait long (at all) for the elevator which is a nice perk in comparison to some high-rise condos we've stayed in the past. Quiet, beautiful town. Was absolutely perfect for my family. Will definitely consider going back. This is so wonderful to hear, thank you so much for sharing this post!! :-) We are so glad you enjoyed this premier condo at Villa Madeira and that you all were comfortable and happy during your vacation time with us! Thank you so much for being our guest and we hope to host a future vacation in Villa Madeira #505 for you soon!!! 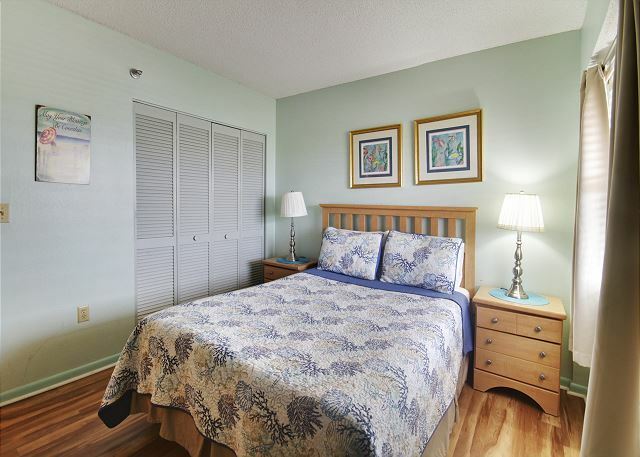 Wonderful, glad you enjoyed this premier condo at Villa Madeira!! Come back for another visit soon! Wonderful to hear!!! :-) We are so glad you enjoyed this premier condo at Villa Madeira and we hope to see you back for another visit soon!! Our condo was very well maintained. Lots of sand and pool toys in the closet. The kitchen was very well stocked and the beds were all very comfortable. We celebrated my granddaughters 5th birthday and she was excited to have such a nice place to view the beach and celebrate her birthday. The beach was well maintained, the pool was very clean. Dont forget your key or you cannot get in/out of the pool, beach or elevator. Our last night was a bit annoying as the people above us were extremely loud, moving furniture and smoking from their balcony, which came down to our balcony. Otherwise, we had no complaints from other people from this unit. Lots of great restaurants in this area with a very short drive or walk. Be sure to visit the candy and ice cream store across the street as it was a fun experience. If you want to pick up sand dollars, use Sun coast water sports to take a boat ride to Shell Island. It was a beautiful fun filled ride with lots of dolphin sightings. We will return again for another family gathering and fun filled adventures in the sun. What a fun family trip this sounds like!!! :-) We are just thrilled you all had a good stay in this premier condo at Villa Madeira and that you all were comfortable and happy....minus the noisy neighbors above you that last evening! It sounds like you definitely took advantage of the fun activities in our area and that is always so cool to hear about from our guests!! Thank you so much for choosing to stay with us and we look forward to having you back on Madeira Beach for another family getaway soon! Great location, comfortable beds, and very well equipped kitchen. Only complain would be the awful sheets that would not stay on the beds. Called and requested more and they were delivered right away, but they were no better. Also, would suggest a key pad for the lobby door and gates to the beach and pool. With more than two people staying at the condo it was very inconvenient with only two sets of keys. You needed a key to get off and on beach as well as in and out of pool. Otherwise, would definitely stay again. Oh we are so glad to hear you enjoyed it!!! :-) Thank you so much for staying with us and we hope to see you back for another visit!! Family headed south to Madeira Beach for a much needed winter getaway. We’ve traveled to Madeira Beach before, staying in the past closer to Johns Pass. This time we stayed more in the middle of Madeira and Redington shores at the Villa Madeira. The property is a little older but extremely well maintained and clean. Beach location was excellent, we noted one of the nicest along the beach given the depth of the beach, how well maintained it was and the fact that we literally walk out right onto the beach. Honestly beach part of the experience couldn’t be beat. Unit 505 was abvertised as a premium/premier unit and for the most part it was. Only item that was clearly dated were the TVs. The TV in the living room was an older low end smaller TV not up to par with what you would expect from a unit with a premium badge. Needs a 50” to 60” flat panel LED. 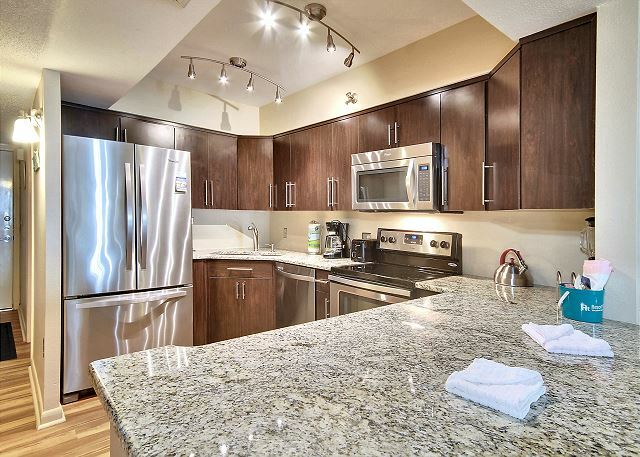 Other than that features such as wood flooring, kitchen granite and stainless and master walk in shower very nice. Management company was great to deal with, other then the after hours answering service with whom we dealt for check in. Overall excellent excellent experience and can’t wait to visit again. Thank you so much for the feedback and we are so glad to hear you enjoyed this location!!! 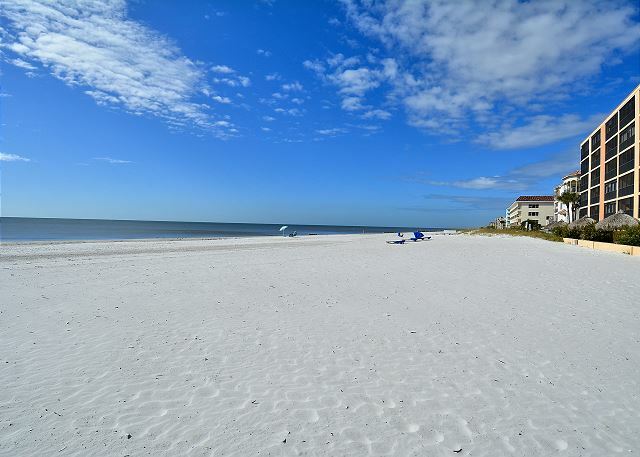 The stretch of Madeira Beach really is awesome and we are so glad you thought the same!! :-) We have passed the comments over to the owner for their review in regards to the possible TV updates, thanks for telling us!! 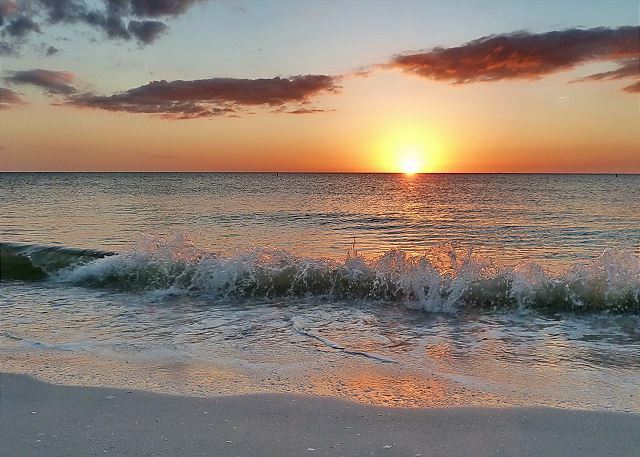 Thank you for staying on Madeira Beach with us and we hope to see you back for another visit in 2018! Great time, very nice condo, clean and neat. Beds could be more comfortable, sheets didn't seem to fit well but other than that it was great ! The rental team I worked with were wonderful, very kind and helpful. Hope to come back !! Second time staying in this unit, and will come back soon. Everything you could want is near by. Family had a great time. Love it!! Madeira Beach is a great place for a family getaway and we are so glad you all had a good time!! :-) Thank you so much for choosing to stay with us and we will see you for the 3rd visit soon! Madeira Beach tranquil, and the best beach! The properties description was as described. The property had been cleaned to an excellent standard and was well maintained. Resort Rentals provide excellent customer service to their guests who use their service. I would always recommend Villa Madeira, each condo is unique. 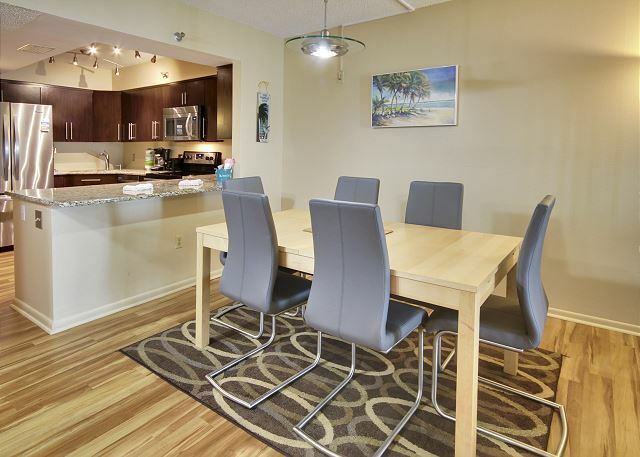 Ideal location for going up or down the coast or into the Tampa area. Restaurants are close by. Plenty of choice for supermarkets and shopping. So great to hear!!! :-) Thank you for staying with us, we always enjoy having you and look forward to your next Madeira Beach vacation!! Kitchen was very well stocked. Also lots of beach items, chairs, coolers etc in balcony closet. Great location. No complaints. Wonderful to hear!! 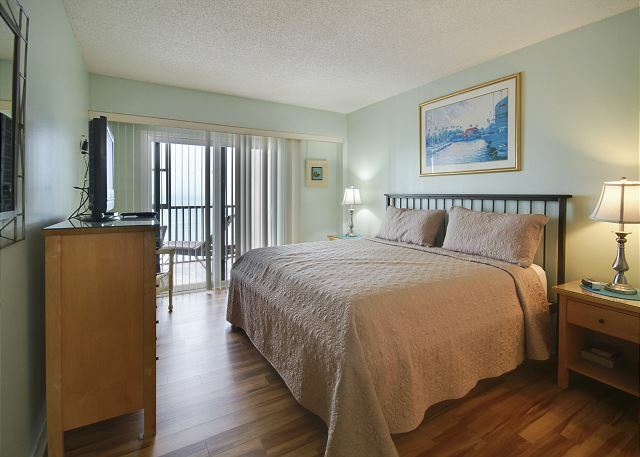 We are so glad you enjoyed all that this premier condo at the Villa Madeira has to offer! Thanks so much for staying with us, we enjoyed having you and hope to see you back again soon! a guest from East Liverpool, oh does not recommend this vacation rental. The room was one of the nicer ones we've stayed in around St Pete. 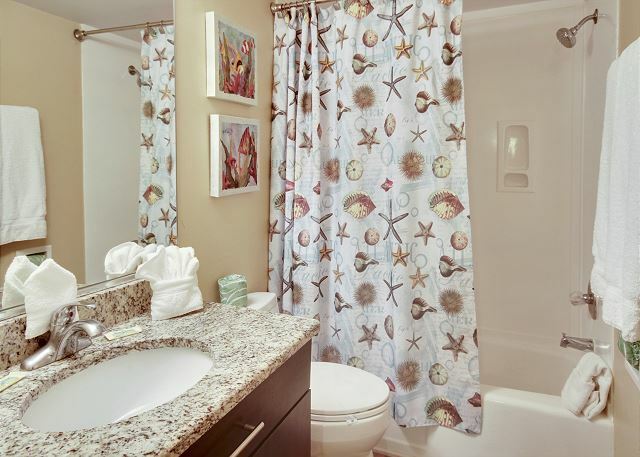 A few issues like the outlet was falling out of the wall the TV was plugged into in the bedroom and the door to the shower in the Master Bath forced you to go into the Shower just to close it to use the toilet. Otheriwse the room was nicely furnished and the kitchen was beautiful, the pans seriously need replaced, they are warped and made cooking on the electric stove a pain. Now the big issue, this place was seriously a prison with old outdated security locks that required special security keys. EVERYTHING required those keys, the elevator to get to the room, the gate to get to the beach, the gate to get to the pool, even the bathrooms INSIDE the locked gated pool needed them, unbelievable! If they were code locks it wouldn't have been as bad, but they forced use to keep switching off keys to do anything. If you have a big party good luck as they only give you two keys. One of the residents told us they just installed all these locks less than a year ago, why wouldn't you put in a more recent system, like coded locks, or even the hotel swipe cards? This made enjoying the pool and beach a serious hassle. Not to mention the pool closed at dusk and didn't permit any swimming even though it was lighted. Its sad the the HOA ruined this otherwise nice set of condos. We won't be returning. We are so sorry for the inconvenience of the needed keys at this property. We can definitely appreciate the frustrations that it caused you and we too would love to see a different key system in place at this location. As you stated, this is something that is done through the association so it unfortunately is something that is out of our hands. Outside of that, we are glad you enjoyed the condo itself! It is one that falls into our premier category of condos in our program and we have a number of other premier units at different locations in our inventory that perhaps could be a nice fit for you! Thank you for your feedback and we will be sure to pass it over to the association on your behalf. We hope to have you back at a different property in our inventory for a future FL visit. Not the cleanest. Dryer is a fire hazard.OLD! Needs to be replaced. Lint filter broke. Takes forever to dry your clothes. Water barely comes out of the shower in the 2nd bathroom. 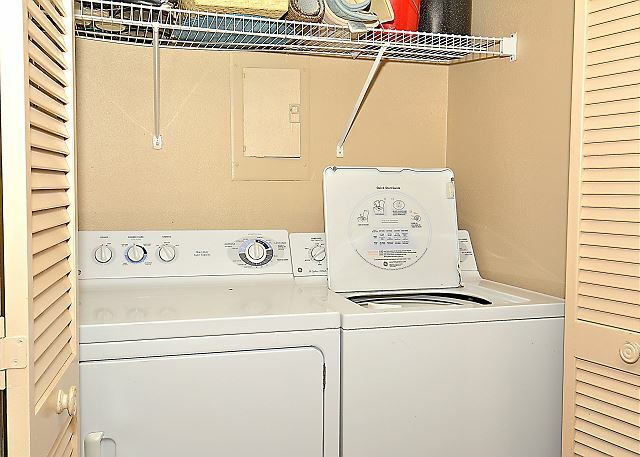 We are so sorry for the dryer issues that you experienced! We have passed this over to the owner of the condo and will be sure to have this corrected immediately. Please do not hesitate to contact us at the office while you are here as we do have staff in place to address anything that may come up. We will also be sure to have the water pressure looked at and thank you for letting us know! We are glad the Gulf view from the balcony was enjoyed and we hope to host a future vacation to our area for you. Bed and pillow was terrible. Couldn't sleep . My hubby or myself. Tap in bathroom doesn't work. All in all it was great. Thank you for your feedback on your recent stay. We do apologize if the bedding and pillows were not a good fit for you; we know how frustrating that can be! We do have additional pillows here in our office so if you are in need of anything please do not hesitate to contact us in the office and we are happy to provide you with others should you need. 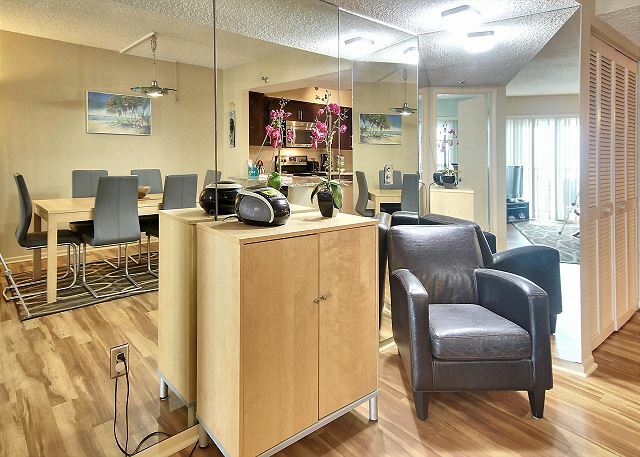 We will be sure to pass along the comments to the owner of the condo as well for their review. In regards to any maintenance items, again, please just let us know here at our office and we are happy to have any items addressed for you. We do have staff in place to take care of anything that may come up and we want to be sure you are comfortable in your rental. 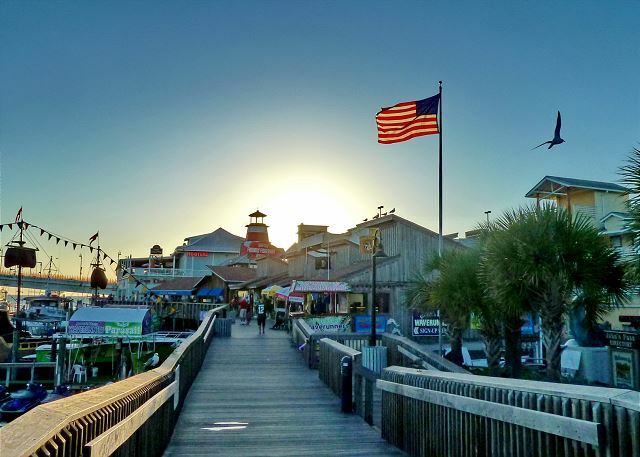 Thank you for being a guest with us and we hope to have you back on our beautiful beaches again soon! We have stayed at the Villa Madeira multiple times now and absolutely love it. 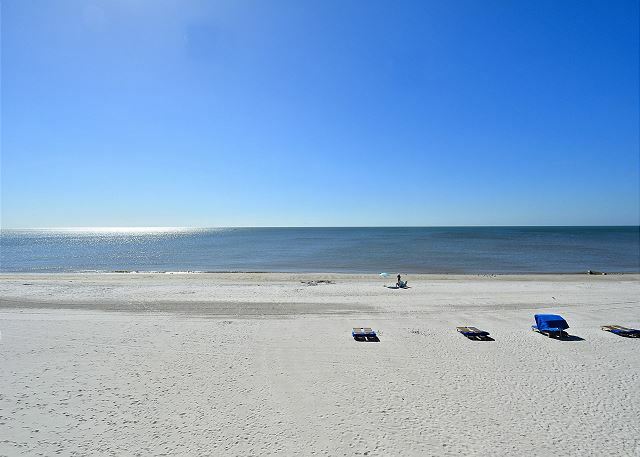 The condo is clean, updated, well equipped with a gorgeous view of the gulf of Mexico. We also love the laid back feel to the area. The rental company is excellent and a pleasure to work with. If your looking for a wonderful Florida vacation really doesn't get any better than this. Thank you for your post! We are so glad you enjoyed your stay in this premier condo at Villa Madeira, it really is a lovely unit!! Madeira Beach does not get as congested as some of the other locations in the area so it really does make it a quaint, beautiful location! We appreciate the kind words regarding our staff as well, we work hard to accommodate our guests so thank you for that! 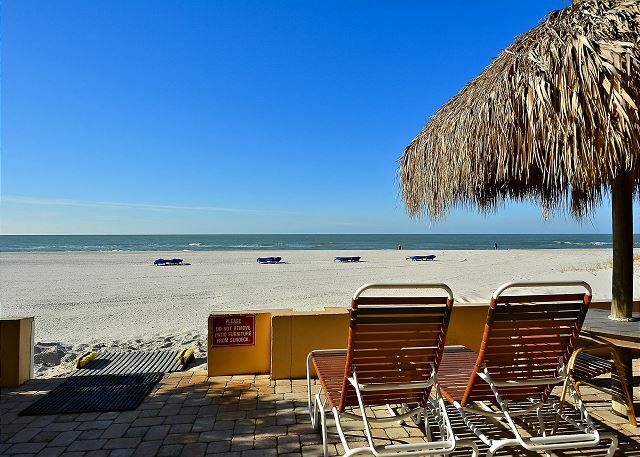 :-) We look forward to your next Madeira Beach visit with us!!! Beautiful beaches, great people, condo was very nice. I would recommend this complex. 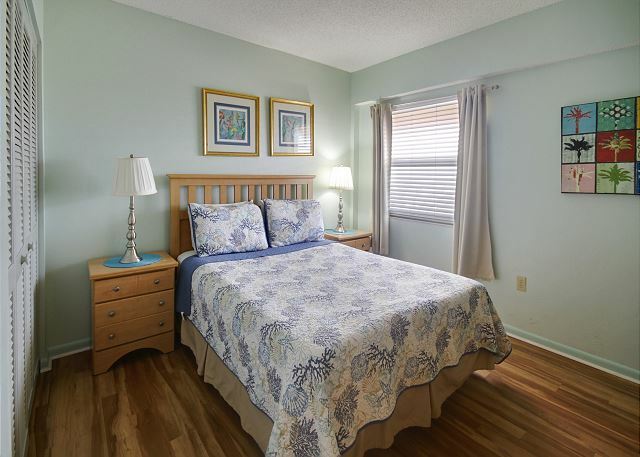 Located close to shopping and great restaurants. Thanks for the post! 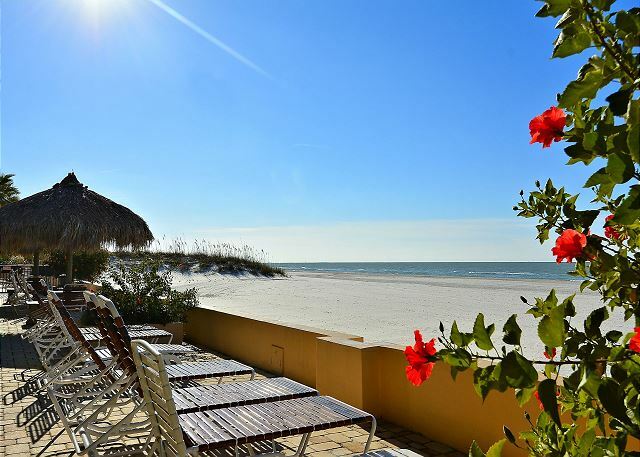 We are so glad you had a good time on Madeira Beach and you are right, Villa Madeira is a great, central location! This condo is one that falls into our premier category so it carries recent updates throughout, we are so glad you enjoyed it!! We look forward to having you come back and visit again soon! Awesome. We have stayed in Anna Maria, Siesta Key, Clearwater, and enjoyed Madeira Beach, Treasure Island, and St. Pete Beach better than any. We will be back. Condo was great except the stairs were closed and the elevator slow. That's not a big deal except there is no fan or air conditioning in elevator. It needs to have a fan at the least. Or stair way needs to be open so one does not have to hastle with the elevator. Thanks for the post! We are so happy to hear that you enjoyed our beaches!! :-) We apologize for the elevator issues you experienced during your stay but just wanted to update you that the association will be doing an "Elevator Modernization" in September. Hopefully that will address the issues you mentioned here. We were 12 family memebers renting two apartments, #502 and #505, we were very happy with everything, great place in very good area. A little too hot for some people. Maby a little too much meintenace going on, but we understand that it has to be done somehow. Thanks for us. The room was clean and very nice features, marble, stnless appliances, tile, etc. Ocean front, nice balcony furniture, nice location and walking distance to shops etc. Ocean and shells nice. Great location. Enjoyed John's Pass. Enjoyed the tranquil evenings listening to the ocean. Safe for the grandkids. Plan on a return visit. great location , had a strong odor upon arrival. was not clean, tables , counter tops , floor...we had to clean. Sweeper didn't work,sheets do not fit master bed,kept coming off while you slept.location was fantastic. We are glad you enjoyed the location but we do apologize if things were not up to par as they should have been for your arrival. This unit has had some nice updates and deep cleanings, it looks great! We hope to have you back in the future. Loved everything about it except the day we had to leave. As usual, the vacation was fantastic! Beautiful scenery, wonderful weather, delicious food, and accommodating hosts! Villa Madeira was great, will be back again and again! We had great time at Villa Madeira. The property and the location were perfect as advertised. 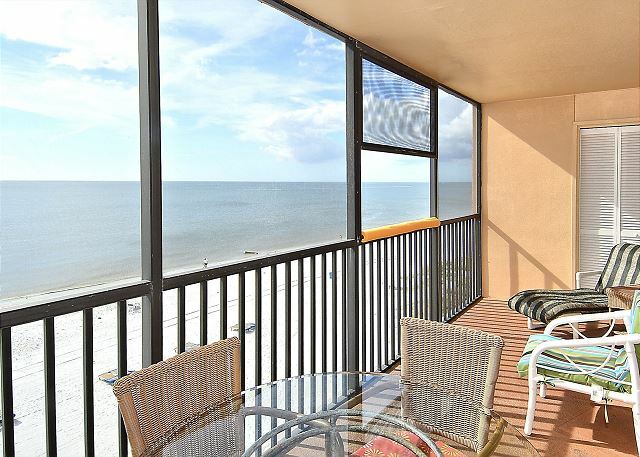 Great location right on the beach with a screened in balcony. 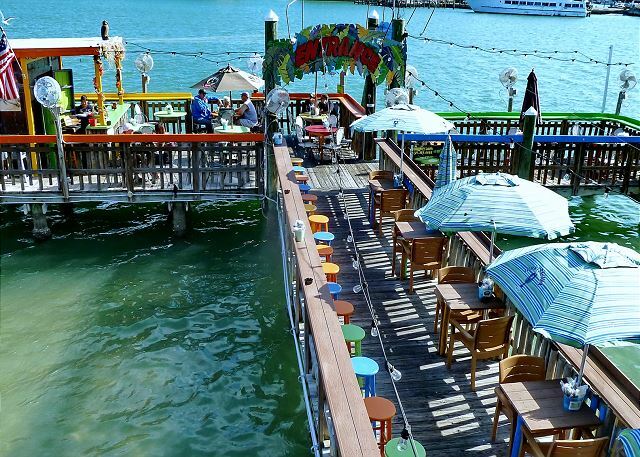 Close to shopping and restaurants at johns pass and the best sangria on the planet at Lisa's restaurant. Clean, convenient and spectacular sunsets. Second room it the railings were loose. The unit was clean and updated. The bedding linens were clean! Bed comfortable. One complain: bathroom floor molding missing around sink. Didn't like having to drive to drop off keys. This was a great vacation for our family. The condo is very nice and very clean. We checked in late on Christmas night and they were awesome about working with us to make check in very easy. The condo itself is very nice. If you are looking for 5 star, this is not it. But the bedrooms are good size, the kitchen is very nice and well stocked. The living room area only has a wrap around couch so it is a bit small. Very nice screen porch to watch the ocean and the dolphins which we saw on multiple days. The beach is awesome. Sugar sand and very clean. The heated pool was very nice to have in Dec. Lots of great restaurants close by as well as grocery stores within 2 miles. We really enjoyed staying here and plan on returning. This was our 2nd time staying at the Villa Madeira condo complex because we love the area and location. The private beach and pool area are very nice and the area is more family/kid friendly. Our condo was clean and well equipped. The furniture and decor were not my style but the rooms overall were still nice. I'm sure we will be returning in the future. Good location, comfortable livingroom and beds. Upgrade the bedding sheets. Cheaply sewn without elastic in corners so it Never fits and creeps off every night. slso the master bedroom vertical blinds shed their panels regardless of how carefully you close or open. The cleaning service needs doesn't wet mop or dust furniture and floors thoroughly. I would return and the rental office was ecceptionally detailed and helpful. We couldn't have asked for a better view. Our 4 kids and my husband and I fit perfectly in the condo. Great space!! 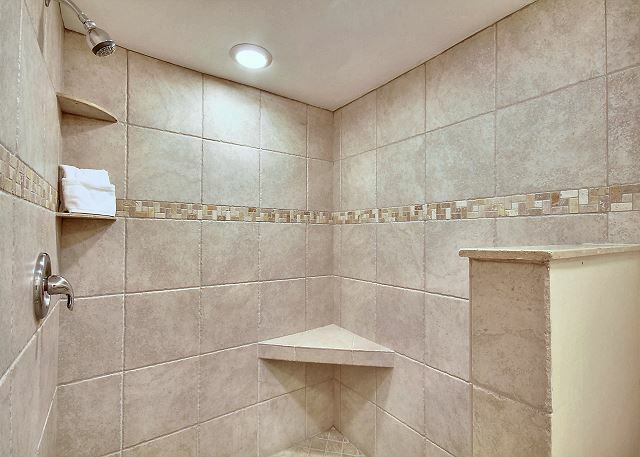 Fabulous large shower in Master Bath was an extra bonus! Resort rentals was so friendly & helpful as well. We lived on the beach all week. Only downside were the broken vertical blinds in master BR & living room. They kept falling off, but didn't affect our incredible stay! We would for sure return to this unit!! Location was great, property is aging, sheets did not fit and would not stay on bed making sleeping very uncomfortable. This was a very clean quite place to stay. Was in unit 505 we loved it. Right on the beach . The staff was very very helpful. Will be beck next year. Very clean quite loved the place would stay again. Right on the beach the pool was very nice. This cond. is a must see very very nice. Will be back next year.This cond. has every thing you need. My daughter and I had a fabulous time at Villa Madeira. The beach was amazing - not crowded at all. 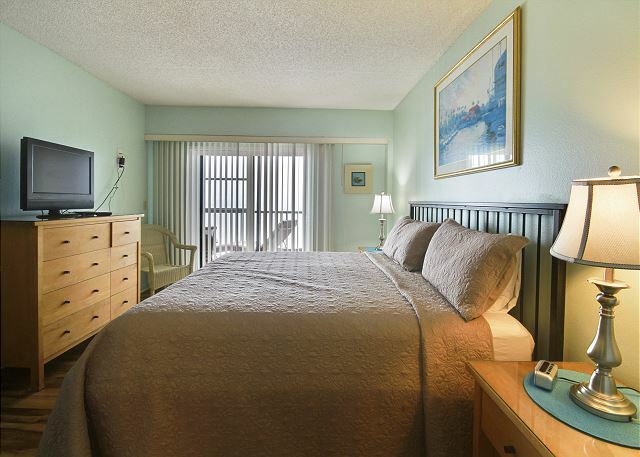 The condo was perfect - all of the comforts of home with the conveniences of a hotel, and not too far from St. Pete's and Clearwater. We would definitely stay here again! Our Madeira Beach, FL vacation. I can't say enough about the Vacation Rental people that I spoke with. Our plans changed at the last minute, so we were earnestly looking for a gulf side rental for the 4th of July, just one week before July 4. They looked for us a place to stay; and, at the last minute one became available. We were extremely pleased because we were directly on the gulf. The condo, like the Rental people, was exceptionally nice. We would surely recommend your Rental to everyone. We had some special needs because we are from IL and the people there were extremely helpful! Everyone went above and beyond to make us comfortable. The condo was very nice and clean. We would consider staying here again upon our return! We always stay at this resort when we vacation. Perfect area, wonderfully clean and exceptionally well kept. We consider this our "home away from home!" great family get away ! Everything was great expect there was trouble with the elevator. We have stayed in this location just about every year for the past four years because the location and units are good but the elevator has gone out and made us carry things up to our unit at least one time every time we have stayed there. We had a great vacation at Villa Madeira. We really like the property, the beach, the location. We unfortunately were not able to rent the same unit we stayed in last year, so we will have to book earlier next year. Unit 505 had a lot of nice things about it, 3 bedrooms, comfortable living room and patio furniture, hair dryers, some beach stuff (chair and umbrella were great to use). However, the beds were about the hardest I've ever slept on. For that reason, we would not stay in unit 505 again, which is a shame, because otherwise, it was very nice, and we are looking forward to returning to Villa Madeira again next year. 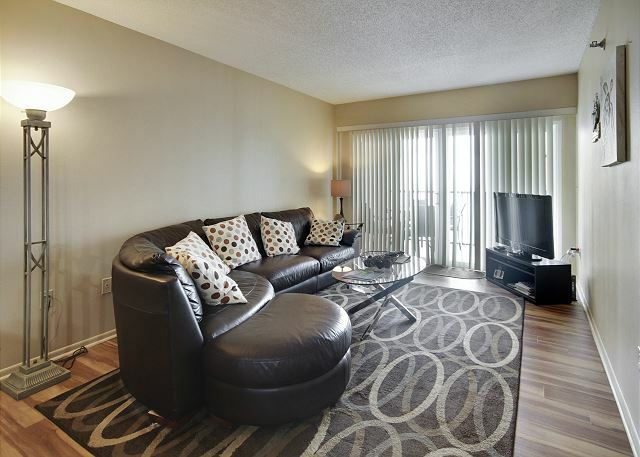 Great location and clean condo with a very helpful and friendly staff. We liked the location and condition of the beach. The unit was nice with no problems and nice master shower. I did see a code issue with the wiring of the dining room light fixture. The floors could have been cleaner but that was about our only complaint. We have stayed in the area five or six times and this is the best location we have stayed at so far. I wish I would have book earlier to save more money. Thank you for letting us use your property. We stayed February 23 - March 2, 2013. It was clean and comfortable and the location was great. It was very cool vacation! We started the vacation with no A/C in the unit, however with one phone call we had a repair man at the unit within a couple of hours to resolve the issue. Overall the stay was great. 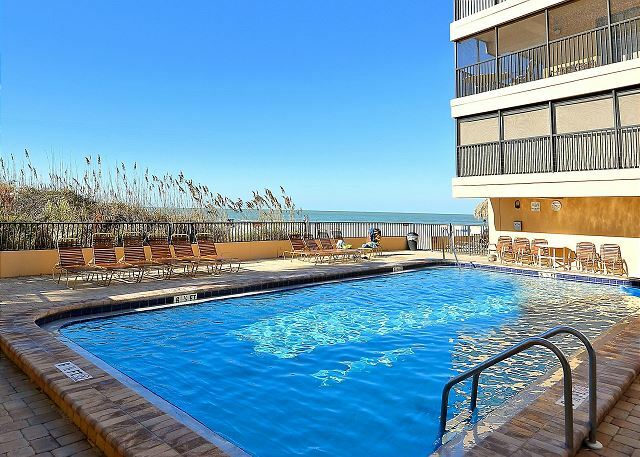 We enjoyed easy access to countless shops and restaurants, the beach, and a nice pool. Not to mention the awesome candy/ice cream shop right across the street. It was a fun way to end a long hot day on the beach, especially with a couple of children in the group. I think this was our 6th stay at Villa Madeira. We like the location and the facility. The units are clean, modern, and in good repair. I was impressed on how well it was furnished.The kitchen especially.We had everything we needed. There were very poor fitting sheets. The matress pad wre plastic and moved around allot but the matress was very nice. The HD TV's are smallest I have ever seen. Need to upgrade to at least 40" in the main room and attach a cable box. The pool is very nice great for doing laps. The experience and location was great.Would do it again with out a doubt. It diffidently is a great place to relax and enjoy. The only reason i gave item #4 a 3 star rating is because the floor was very dirty. It was only swept and was badly in need of a wash! It was a small task to perform for our 2 week stay. Hi Mr Sommer, Thanks for your review. I have passed on your comments to the cleaning company. If this were to ever happen again, just give us a call and we will send someone out to clean it for you. Thanks again! We love working with Resort Rentals, great staff, very carrying & helpful. We loved our stay on this property. A minor comment is that the unit could probably benefit from a little upgrading but it was basically, clean, comfortable and spacious. We would, however, strongly suggest a couple of extra chairs in the living room area - if there were 6 people using this unit, the sofa just isn't enough. I was able to take my parents & in-laws with us. It was very comfortable for 6 adults and the walk-in shower worked out great. We had a wonderful week..thank you. We were very satisfied with this condo on the beach. It was up to date, clean and had everything you would need away from home except for the food. Master bedroom and LR has sliders out to a big deck that over looks the beach/ocean. The Resort management were great and always helpful and quick to respond on any questions. We would stay here again and hope to soon. I would recommend this to anyone. We had a great time here. The villas are in a perfect location and we saw dolphins swimming from our balcony most days!!! You can hear the sea all night and there is so much wildlife to marvel at! Easy to get to Orlando and much nicer than staying inland. Our villa had the main bedroom and lounge facing sea which was perfect. Strongly recommend. This was our first trip to Madeira Beach. The Property managers were great and the location was perfect. We have 2 boys and were there with family staying in another unit. The boys loved being able to use the skim boards and boogie boards left for renters. Plenty of space and directly on the beach. The decor was a little outdated but they had everything you needed to make your self at home. I couldn't beleive how many dolphins we saw...all day long, not just in the mornings! I would go again, Villas Madeira was great. Elevators were a little slow.....but we were on vacation! Didn't like the key system they had to get in the elevator or stairwell it should be a code.Also the rental place was not in the building had to drive an extra ten minutes to check in.Those were the only problems! My family loved the condo: 3 br, 2 baths, enough space for us to enjoy our vacation, time together and time alone. Love the screened in porch overlooking the beach and ocean. Conveniently located near restaurants and grocery stores. Kitchen was very well equipped. The management staff was great. I'd definitely stay here again. This was our 5th visit to Madeira Beach and our 3rd stay at The Villa Madeira Resort. The grounds are well kept, the beach is beautiful and our condo was the best one yet! We would definitely go back. The location was excellent and amenities were great! The heated pool was a real treat and I'd highly recommend the Candy Kitchen across the street for ice cream. 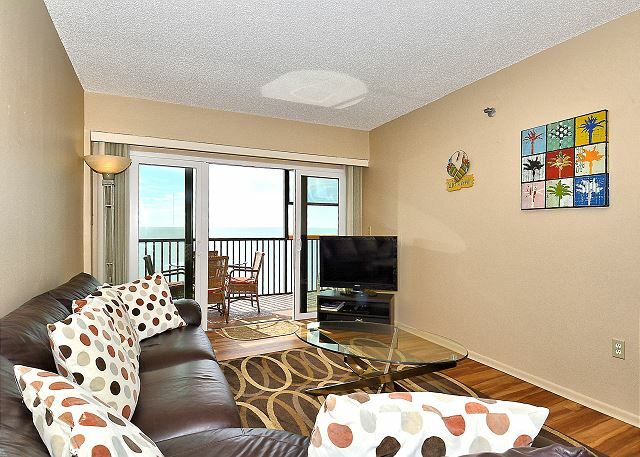 Very clean and the balcony overlooking the Gulf is a huge plus. The only drawback was that the beds were on the hard side and a bit uncomfortable. Otherwise, the stay was perfect! !